To make this cake, I had to talk my sweet niece, Rhonda, out of the recipe. I guess it has been a secret for a long time. And then I had to get her approval to put it on my blog. Thank you, Rhonda. And thank you to her daughter, Holly for helping me. 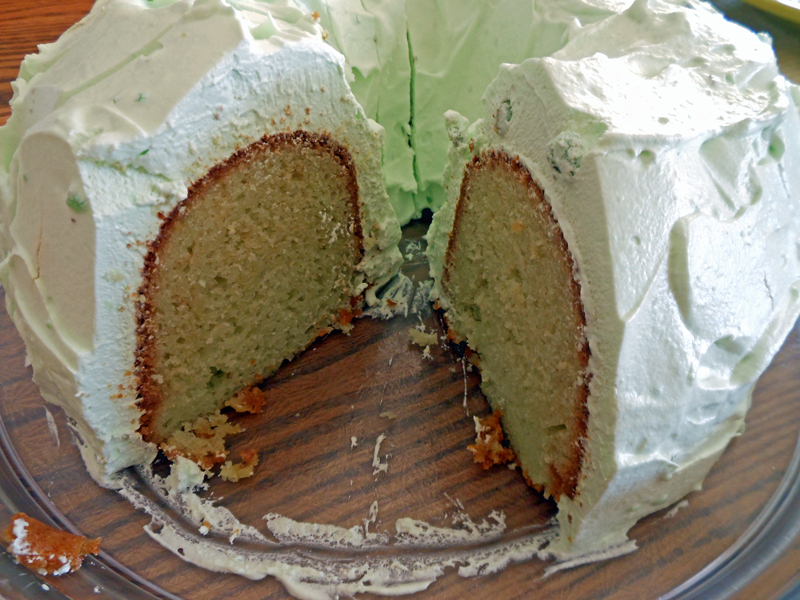 This is a delicious cake to make for St. Patrick’s Day. Or any other day for that matter, but it is such a beautiful green, it just seems right for St. Patrick’s Day or Christmas. In a mixer, combine all ingredients; mix well. Pour into a greased and floured bundt cake pan. Bake at 350 degrees for 40 to 50 minutes. Cool completely and then frost. Beat everything together and frost cake. Refrigerate. This is such an easy and delicious dessert to make. I made this for our bridge group and everyone loved it. My 10-year old grandson loves strawberries and he was considering having this for his birthday cake this month. We will just have to wait and see what he decides. For glaze, in a large saucepan, combine the sugar, cornstarch and jello. Add water and stir until smooth. Cook and stir over medium-high heat until mixture begins to boil. Cook and stir 1 to 2 minutes longer or until thickened. Remove from the heat; cool completely. Cut half of the strawberries into quarters; fold into glaze. In a small bowl, beat cream cheese until smooth. Beat in milk until blended. Fold in whipped topping. 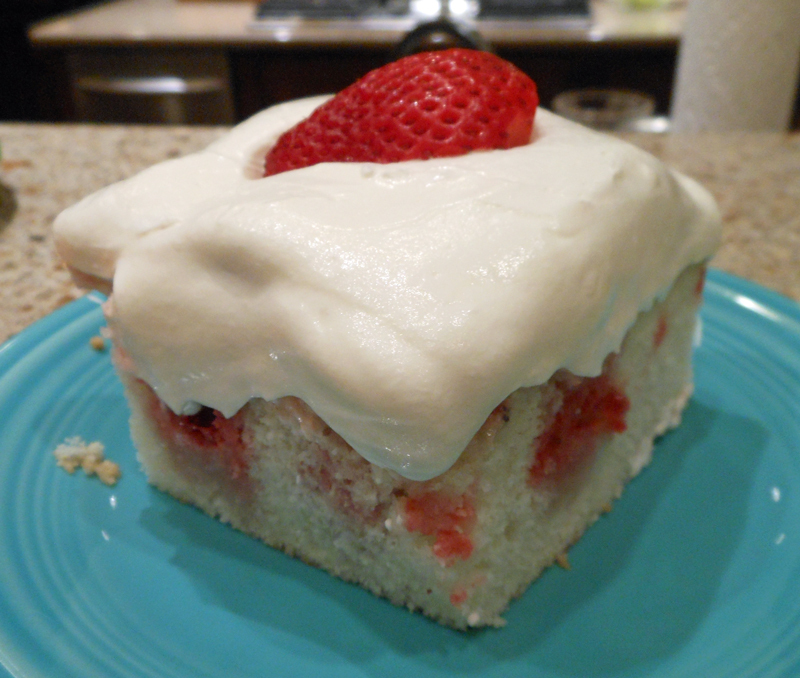 In a 9 x 13-inch baking dish, layer half the cake cubes, glaze and cream mixture. Repeat layers. Cut remaining strawberries in half and arrange over the top. Cover and refrigerate for at least 2 hours or overnight. I have been making this cake for years. My family just loves it. But it is the frosting that makes this cake. You can make a layer cake, a 9 x 13 cake or cupcakes. If you make cupcakes, it makes about 18. Cream butter and sugar until fluffy. Add eggs and beat well. Make paste of cocoa and food coloring and add to sugar mixture. Add flour and salt alternately with buttermilk, vanilla and water. Add baking soda and blend well. Stir in vinegar gently. Do not beat!! 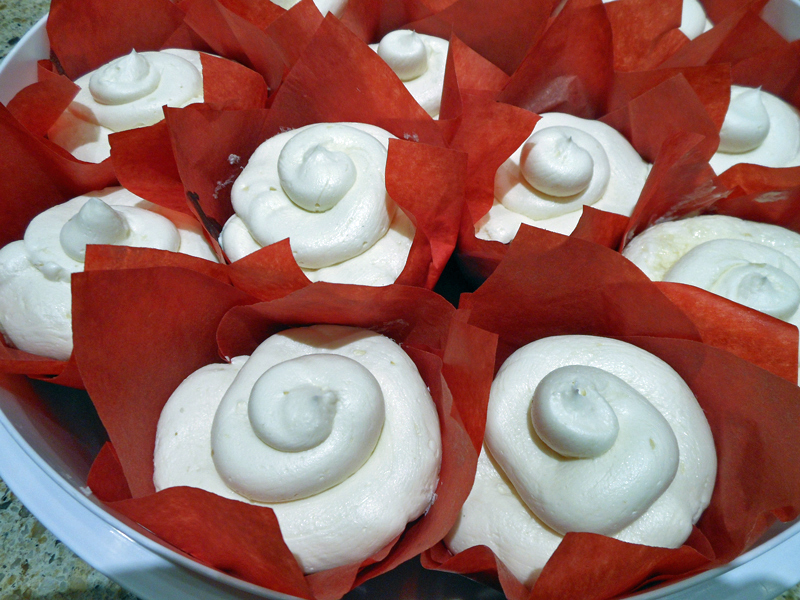 Bake in 2 round pans for 30 minutes, a 9 x 13 baking pan for 35 to 40 minutes, and cupcakes for 20 minutes. Or until toothpick comes out clean. Cool and frost. Cook flour and milk until thick, stirring constantly. Cool completely. Cream butter, sugar and vanilla until fluffy. Add cooled milk mixture. Beat at high speed on your mixer for 10 minutes. Yes, I said 10 minutes. Frost your cake. Divide butter evenly among 8 (1-cup) ramekins. Place ramekins on a rimmed baking sheet. Place in oven until butter melts, 3 to 4 minutes. Set aside. In a large bowl, stir together flour, 3/4 cup plus 2 tablespoons sugar, 1 1/2 tablespoons cocoa, espresso, milk, and vanilla. Pour batter over melted butter in prepared ramekins. 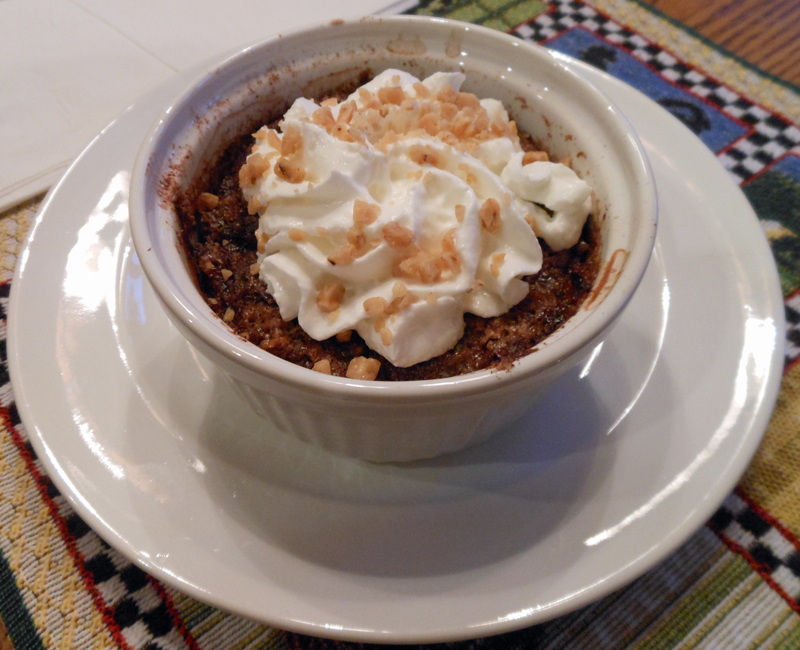 In a medium bowl, stir together remaining 1 cup sugar, remaining 4 tablespoons cocoa, and 1/2 cup toffee chips. Sprinkle over batter. Pour approximately 3 tablespoons boiling water evenly over top of each cobbler. Bake until top is set, 20 to 25 minutes. (Center will be not be set.) Top with whipped cream and remaining toffee chips. Note: You can also prepare this recipe in a 2-quart baking dish. This is somewhat of a pudding cake. Rich and heavenly! 1/2 cup chopped nuts, opt. Mix cake as directed on box and pour into greased and floured 9 x 13-inch baking pan. 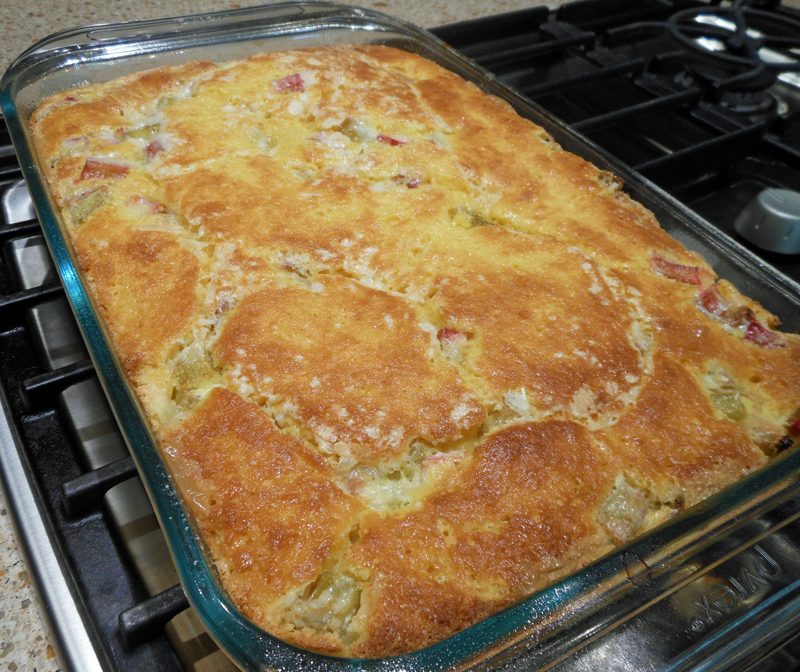 Sprinkle rhubarb and nuts over cake batter. Sprinkle sugar over rhubarb and nuts. Pour unwhipped cream over top. Bake in 350 degree oven for 40 to 45 minutes. My husband doesn’t cook or bake, so when he came to me and said he wanted to make this bread I was shocked. I said “Go For It!, I’ll give you moral support”. I have to say that he picked a good recipe. It was delicious! Preheat oven to 350 degrees. Grease and flour a 9 x 5″ loaf pan. 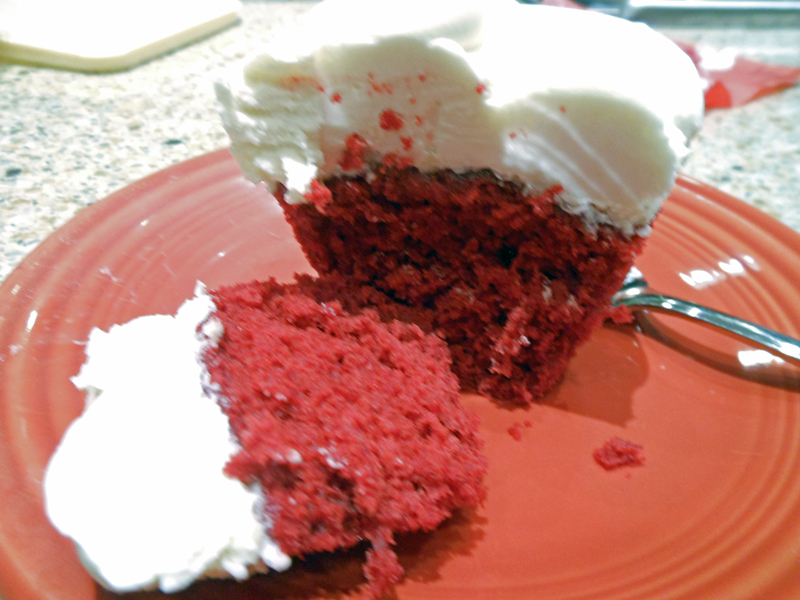 Beat sugar and butter together in a bowl using an electric mixer until smooth and creamy. Beat in eggs, 1 at a time, until incorporated; add vanilla extract. Add flour and baking powder to creamed butter mixture. Mix milk into batter until smooth. Pour half the batter into the prepared pan; add half the apples and half the brown sugar mixture. 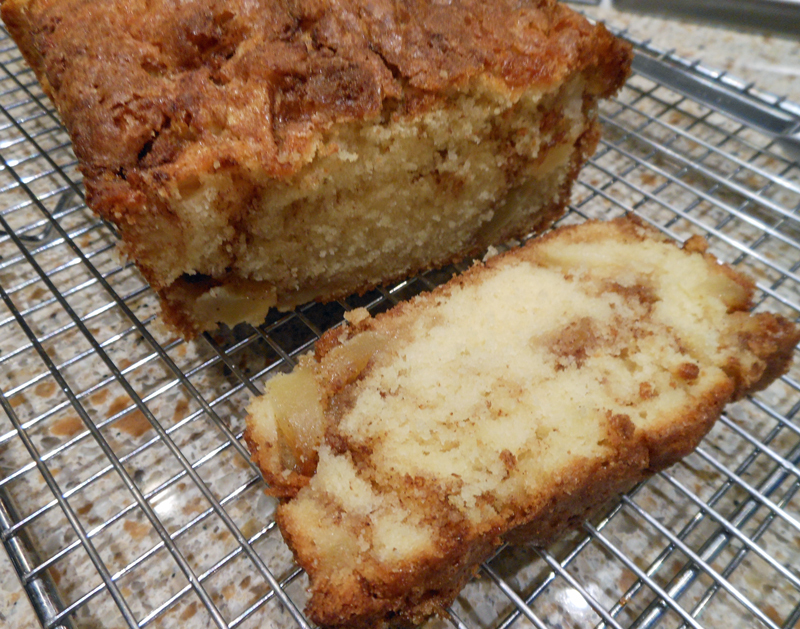 Repeat layer with remaining batter, apples and brown sugar mixture. Swirl mixture with spoon lightly. Bake for 40 to 50 minutes or until toothpick inserted in center of loaf comes out clean. This is so light and refreshing and perfect for a Spring dessert. I just love poke cakes! Yum!! Spray a 9 x 13-inch baking dish with non-stick baking spray containing flour. Mix and bake the cake according to the cake mix directions. Remove cake from the oven and cool for 10 to 15 minutes. Using a large wooden spoon handle, poke holes in top of warm cake at 1 inch intervals. Poke the holes approximately 2/3 into the top of the cake. Don’t poke holes all the way to the bottom of the cake. Put thawed strawberries with juice into a blender. Add strawberry jello and puree. Spoon mixture over the top of the cake. Make sure it soaks into the holes. Prepare pudding mix with 2 cups milk following directions on package. Fold whipped topping into mixture. Take cake out of the refrigerator. 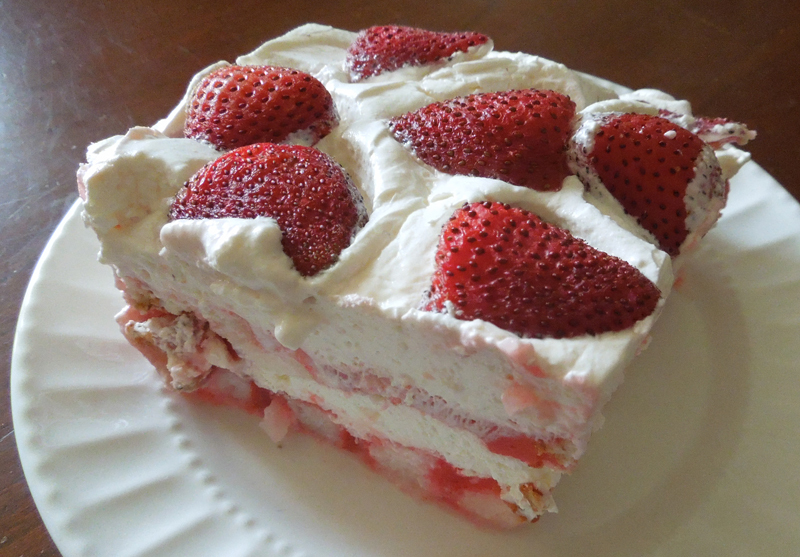 Spread two cups sliced strawberries over the top of the cake. Spread topping mixture over the strawberries. Garnish the top of the cake with remaining 1 cups sliced strawberries.